Sound Clips & Session Photos! 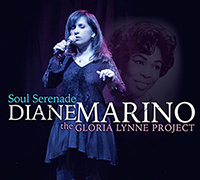 “Soul Serenade” is the title of my newest CD project. 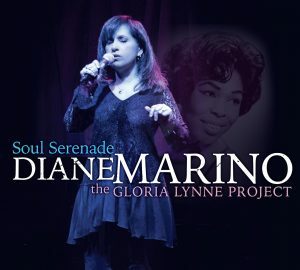 Although not exactly a “tribute” album, it is more of a celebration of the music made popular by the great vocalist, Gloria Lynne. 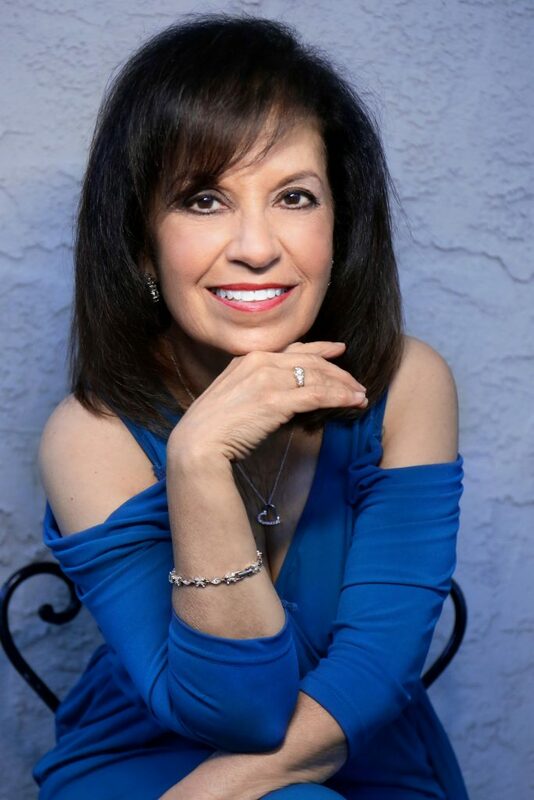 As it turns out, I have been singing some of the material she has been known for ever since I first began to sing professionally- so many years ago! “I Wish You Love” is one of the first ballads I ever sang on a gig. “I’m Glad There Is You” is a track I recorded for my CD “On The Street Where You Live”. 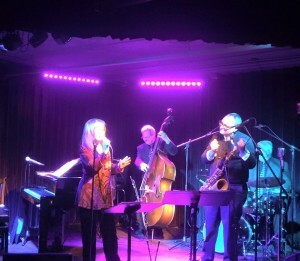 While performing on a recent gig with drummer Vince Ector, I sang “I’m Glad There Is You”, and he reminded me it was one of Gloria’s signature songs. So, I began to research more of Gloria’s work and was instantly mesmerized by her voice, style and emotion. Additionally, her choice of material was instantly appealing to me. I tend to look for songs that are “beyond the norm” of the Great American Songbook repertoire. The songs Gloria Lynne recorded during her career stand alone in their originality and uniqueness. Her performances of these particular tunes move me every time I hear them. As with my previous CD’s, I always learn a tune and then work with it at the piano, making it an extension of what I’m hearing and feeling from the lyric and melody. I should note that I had never heard any of these 14 tunes before I was introduced to them by the wonderful Gloria Lynne recordings. My “concepts” for these 14 tunes came about after much study, deliberation and changes! I wanted to step away from the piano for this project in order to collaborate with someone else’s ideas that could influence the way I might want to sing a particular song. I feel that when you accompany yourself on piano the two elements are inseparable and it was time to do a project in a different way. I asked my dear friend Brad Cole to take my concepts and write the arrangements and orchestrations as well as to play piano/keyboards on this project. He seemed to know exactly what I wanted to do with each of these songs. I think we’ve come up with a fresh approach to this material that Gloria Lynne’s recordings influenced me to explore and ultimately record! 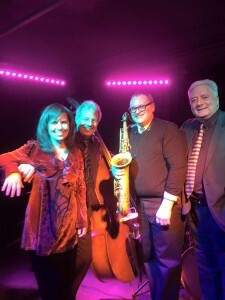 “Diane’s personal style provides the ultimate in cool for jazz listeners of all stripes. 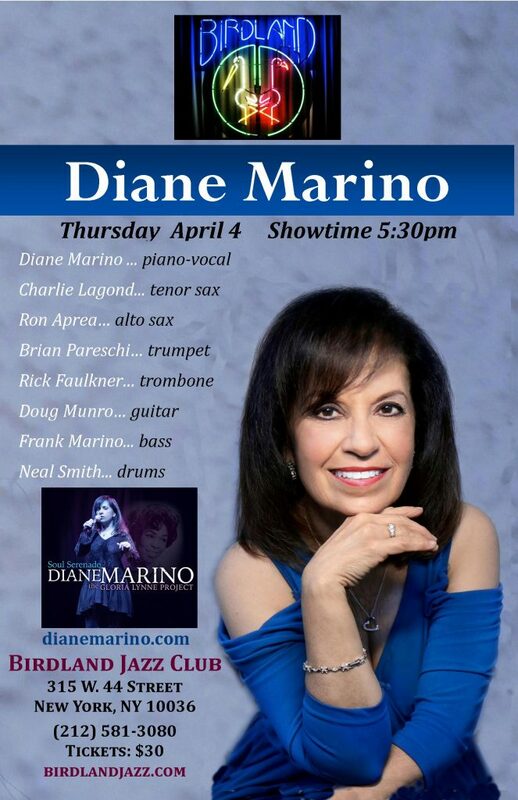 “Diane Marino’s musical instincts have been crafted through experience and are fueled by a hunger to make music that makes a difference. She has done exactly that. It takes a singer to know a singer. Miss Marino makes the most of her vocal talents and, in doing so, pays creative homage to Miss Lynne. 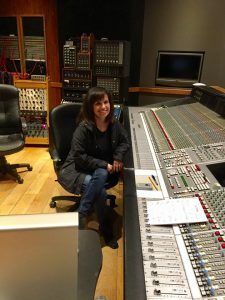 “The musicians are downright flawless here, and settle in instinctively and provide a new energy from scratch on each track. But it’s Marino’s voice that slowly won me over. 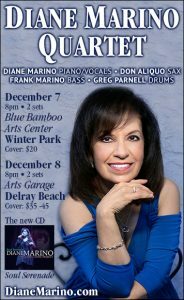 “Marino is equally comfortable with ballads and faster tempo material, infusing many selections with a convincing blues feeling. 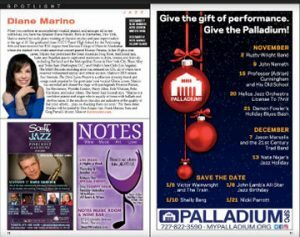 Not having been aware of Marino before receiving this album to review, her work here makes seeking out her prior recordings a likely undertaking”. With tracking completed, mixing the new CD project now! Recording at several studios around Nashville with an amazing group of wonderful players – (and great friends)! BIG thank you to Studios: Gary Belz (House of Blues Studio), Dennis Scott(Scott Free Studios) David Davidson ( Little Big Sound Studio) Frank Marino (The Piano Den).and of course Brad Cole (The ColeMine). Amazing engineers: Gary Dales, Brad Cole , Doug Holmquist, Colin Heldt, Bobby Shin. My love to all the amazing musicians that have contributed to this project!! 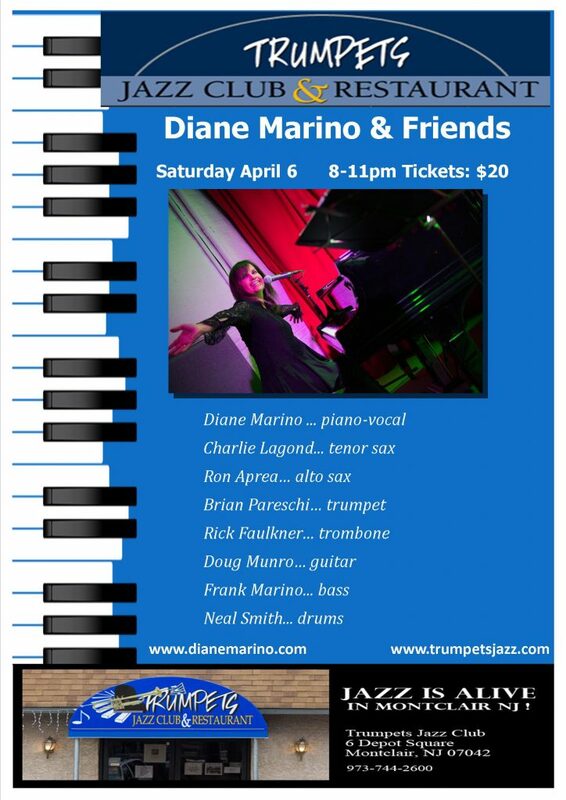 Brad Cole / Frank Marino / Chris Brown / Mark Christian / Don Aliquo / Scott Ducaj / Roy Agee / Tom Moore / Dann Sherrill / David Davidson / David Angell/ Monisa Angell / Carole Rabinowitz / and our special guests, Harry Kim & Doug Munro! View our photos here as we progress! Photos from our 2017 sessions! 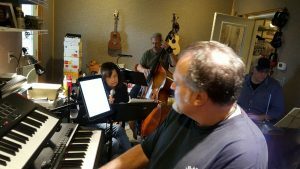 Rehearsals begin for the new CD release! Very excited to announce we’ve begun our final rehearsals for the new CD to be released this year! Very cool arrangements by Pianist/keyboardist/arranger/producer Brad Cole! 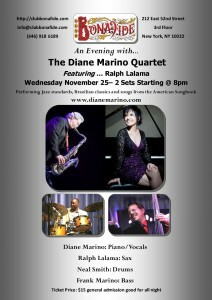 Joining us so far is: Mark Christian (guitar), Chris Brown (drums) and Frank Marino (bass)…. We start recording tracks February 6! 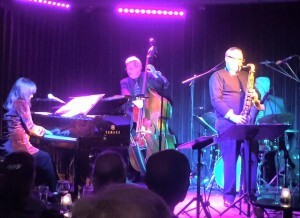 Our debut performance at BluJazz Akron was amazing! Packed house, and a wonderful audience!